Please use this form to apply for approval as a Chemical Dependency Program where Auricular Acupuncturists may practice. We are phasing out our paper applications. Application form and additional information to become a licensed acupuncturist in Arizona. All required documents for this application must be received by the Board office 14 days prior to the next scheduled board meeting, to complete administrative review and to be scheduled for board consideration. All acupuncture license applicants must submit a set of fingerprints as part of the licensing process. Please submit the Initial Application, Fingerprint Card, AND Citizenship Form with your other documentation. 1. Evidence of successful completion of Clean Needle Technique Course as approved by the Board. Have been licensed by another state with substantially similar standards, AND have not had certification or licensure revoked. A minimum of 1,850 hours of training. Of the 1,850 hours, at least 800 hours must be in Board approved clinical training. 4. Disclosure and evidence of all active and past professional health care licenses and certificates issued by this state, another state, district or territory of the United States. 5. A photograph taken within the past year, not less than 2” x 2”. 7. A completed Arizona Statement of Citizenship and Alien Status for State Public Benefits form. 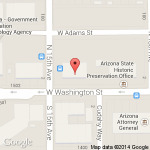 Please make checks or money orders payable to the Arizona Acupuncture Board of Examiners. Do not send cash. *The license fee is paid at the time of application. **The fingerprint processing fee must be paid by money order to the AZ Department of Public Safety if application is submitted by regular mail. Per. A.R.S. § 41-1080.01, if your family income does not exceed 200% of the Federal Poverty Guidelines, you may qualify for a one-time waiver of the Board’s application/licensing fee of $425.00. If you think you may qualify for this fee waiver, please file your application online and then email a copy of your family’s previous year’s federal tax return along with a request for a waiver to [email protected]. We are phasing out our paper renewal applications. All required documents for this application must be received by the Board office 14 days prior to the next scheduled board meeting, to complete administrative review and to be scheduled for board consideration. a. Successful completion of NADA or a Board approved training program in acupuncture for the treatment of alcoholism, substance abuse or chemical dependency that meets or exceeds standards of training established by the national acupuncture or a board approved group. b. Successful completion of a Clean Needle Technique Course approved by the Board. c. Completed Arizona Statement of Citizenship and Alien Status for State Public Benefits form. d. Submit the required application. 4. Payment of the application fee and certificate fee in the amount of $150.00 is due at time of application. Application form for continuing education course approval. All required documents for this application must be received by the Board office 14 days prior to the next scheduled board meeting, to complete administrative review and to be scheduled for board consideration. Instructions and form to initiate a complaint against an acupuncturist. Form to request public documents from the board such as board minutes and mailing lists. Use this form to notify the board of name, address and phone number changes as required by law. These Paper forms are still available however are being phased out.